If you noticed a lot of trading volume at the close of trading last week, don’t worry- you didn’t miss some big news. You see, last Friday wasn’t just any other Friday. And no, I’m not talking about Alibaba. Last Friday was “triple witching” Friday! One of the most frustrating parts to learning about the stock market for a beginner is all of the financial jargon. But it’s understandable that any field will have its own specialized lingo, so I didn’t mind learning the terminology. Today I’m going to explain “triple witching” Friday. Last week, I wrote an introduction to stock options that barely scratched the surface in explaining what they are and how they work. In a nutshell, stock option contracts are contracts that give the holder the right (but not the obligation) to buy or sell shares of a specific stock at a specific price on a specific future date, no matter what the stock’s actual share price does in the interim. But there is another type of forward-looking derivative contract that is very similar to an option contract: a futures contract. In fact, a futures contract is nearly identical to an option contract except that the futures contract includes an obligation (not a choice) to buy or sell shares of a specific stock at a specific price on a specific future date, no matter what the stock’s actual share price does in the interim. So what does all this have to do with “triple witching Friday” and the volatility at the end of last week? Options and futures both have expiration dates, and on those expiration dates many holders of these instruments need to close out or readjust their positions in options, futures, or the underlying stocks themselves before expiration. Individual stock options expire on a month-to-month basis, and there are even weekly options available for most heavily-traded stocks. But the futures contracts only expire four times per year. On these four days, index futures contracts, index options contracts, and single-stock options all expire at the closing bell. In that respect, 4 PM Eastern is the “witching hour” on those four Fridays per year, and the days themselves are referred to as “triple witching” Fridays. This is a chart of my smallest holding, Dynavax Technologies. See if you can spot the triple witching hour on this weekly chart. If you guessed that the witching hour was the part of the chart that I circled in red and indicated “looks pretty witchy to me!” congratulations. You have just the kind of common sense this site is all about! As you can see, after trading between $1.34 and $1.36 for the good part of three days, Dynavax had a massive spike in volume and about a 6% jump in share price in the final hour of trading. So far today, it’s back to business as usual with the stock down one cent on normal volume. 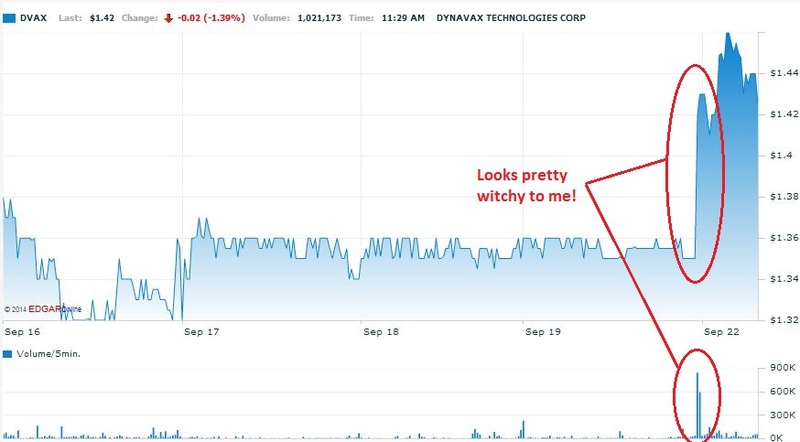 Dynavax is just one of many stocks that was affected by the triple witching Friday. So if you saw something puzzling from one or more of your stocks at the end of the day on Friday but things seem to be back to normal today, now you know the reason why.